Is Park Life a legally certified electronic parking disc? Park Life is certified by the Danish Transport and Construction Authority in accordance with Executive Order no. 150 of 24 February 2016 on parking discs, and certification code FS29 is imprinted on the front. How do I reset the disc if the time or date has been set incorrectly? Turn the parking disc over with the reverse facing upwards. Activate the setting mode by pressing button 1 and holding it down until ‘hours’ starts to flash (approx. 10-15 seconds). When ‘hours’ flashes, press button 2 repeatedly until the clock is set to the correct hour. Press button 1 once until ‘minutes’ starts to flash. Set the minutes using button 2. Set year, month and date as described above (in the order indicated). Finally, press button 1 again until only (:) between hours and minutes is flashing. Check that the time on the front of the parking disc is correct (approx. 10 seconds). Does Park Life work even in cold weather? Park Life has been tested to function at extreme temperatures from -20 to +75°C. The parking disc has been laboratory tested and tested under natural conditions, summer and winter. 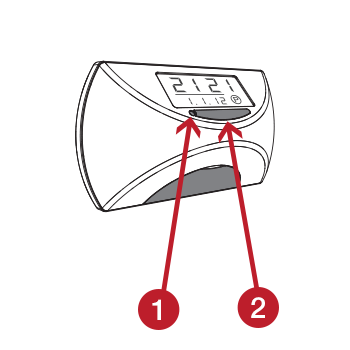 Exposure to prolonged, extreme cold (below -20) may reduce the stated ten-year battery life, depending on how long the disc is exposed to the cold. Can Park Life be dismantled and moved? If you buy a new car or replace the windscreen, you are able to remove the self-adhesive pads on the parking disc. To remove them, heat briefly, e.g. using a hair dryer, while pulling gently on the parking disc. If you cannot remove the disc in this way, use a sharp, flexible kitchen knife or Stanley-type utility knife with a long blade and cut through a couple of the pads. The disc can then be rotated off along the pane. You will then be able to rub the pads off both the windscreen and Park Life. Self-adhesive pads are available from most Park Life dealers. We recommend that you use the original 3M pads as these are tested as suitable for use with the product. Can I cheat an electronic parking disc and operate Park Life remotely? Park Life is a closed system. It has been tested as non-responsive to external impulses. If you attempt to open the parking disc, the system is programmed to self-destruct. How does Park Life work? When you park your car, Park Life automatically sets the clock to the next quarter of an hour after your time of arrival (e.g. if you arrive at 11:37, Park Life sets itself to 11:45). Is Park Life covered by the vehicle’s insurance? In the event of damage, theft, vandalism, etc., your parking disc may be covered under the terms of your vehicle insurance. Ask your insurance company. Does Park Life work in all cars? Park Life works in any type of vehicle, including hybrid and electrically-powered cars. Can I use Park Life abroad? An approved electronic parking disc fitted to a vehicle that is registered in Denmark is legal for use in every EU Member State. Read the signs and do not forget that local parking regulations vary. The battery is an especially durable lithium cell which lasts for at least ten years. The arrow on Park Life sometimes seems to flicker. Does that mean that Park Life is not working correctly? A flickering arrow on the front of the disc does not impact on the functioning of the disc. Your Park Life is working correctly. The arrow flickers only when Park Life has been exposed to strong sunlight. The flickering depends on the angle of the sunlight. Hold your hand in front of Park Life to shade it from the sun and the flickering stops. All LCD displays flicker to some extent in strong sunlight. In fact, this is quite normal for an electronic parking disc. How long does it take the Park Life parking disc to display the parking time? 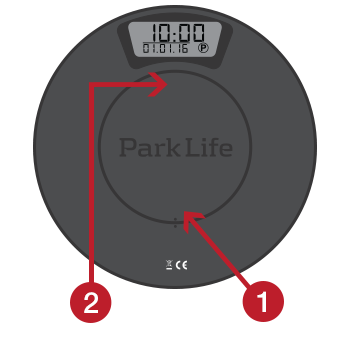 Park Life spends no more than 20 seconds setting your parking time – although 20 seconds may seem like a long time when you are waiting for the disc to set. My Park Life falls off the windscreen – what do I do? The windscreen was either not clean or warm enough when you attached the disc. Always clean the windscreen thoroughly before installation. It is important that you heat the windscreen to AT LEAST 15°C. If not, the adhesive on the pads will not adhere properly to the windscreen due to condensation. Try heating the windscreen carefully (e.g. using a hair dryer). Once the self-adhesive pads have fallen off, they cannot be used again. A new set of self-adhesive pads can be purchased from your Park Life dealer. Is ParkOne 2 a legally approved electronic parking disc? ParkOne 2 is approved by the Danish transport authority in accordance with Executive Order no. 327 (2003) on parking discs, and approval code FS26 is imprinted on the front. How do I reset the disc if I have set it to the wrong date or time? top of the circular back cover and pull it off. To activate the setting function, press and hold down button 1 with a sharp point until ”hours” starts to flash. When ”hours” flashes, press repeatedly on button 2 (+) until the clock is set at the correct hour. Press button 1 once until ”minutes” starts to flash. Set minutes using button 2 (+). Set year, month and date as described above (in this order). Press button 1 once more until only the two dots (:) between the hours and minutes flashes. Does ParkOne 2 function when it is cold? ParkOne 2 is tested to function at extreme temperatures from -20 to +75 °C. It is laboratory tested and tested under natural conditions (Summer and Winter). Can ParkOne 2 be taken down and moved? If you buy a new car or replace the windscreen, to remove the self-adhesive pads on the parking disc, heat briefly, e.g. using a hair dryer, while pulling gently on the parking disc. If you cannot remove the disc in this way, using a sharp, flexible kitchen knife or Stanley-type utility knife with a long blade, cut through all four pads. You can then rub the pads off both the windscreen and ParkOne 2. Self-adhesive pads are available at most ParkOne dealers. We recommend that you use the original 3M pads as these are tested as suitable for use with the product. Can I hoodwink an electronic parking disc and operate ParkOne 2 remotely? ParkOne 2 is an enclosed system. It is tested as non-responsive to external impulses. If you attempt to open the parking disc, the software is programmed to self-destruct. How does ParkOne 2 work? 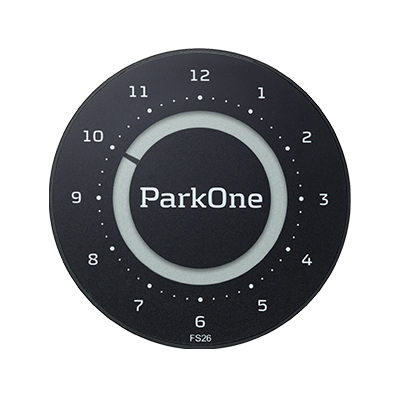 When you park your car, ParkOne 2 sets automatically at the next quarter of an hour after your time of arrival (e.g. if you arrive at 11:37, ParkOne 2 sets itself at 11:45). Is ParkOne 2 covered by the vehicle’s insurance? Does ParkOne 2 work in all cars? ParkOne 2 works in any type of vehicle, including hybrid and electrically-powered cars. Can I use ParkOne 2 abroad? An approved electronic parking disc fitted to a vehicle that is registered in Denmark is legal for use in every EC Member State. Read the signs and don’t forget that local parking regulations vary. The battery will last for approximately 3 years. When there is about one week’s battery power remaining, the diode flashes for 10 seconds, when ParkOne 2 enters or leaves parking mode. 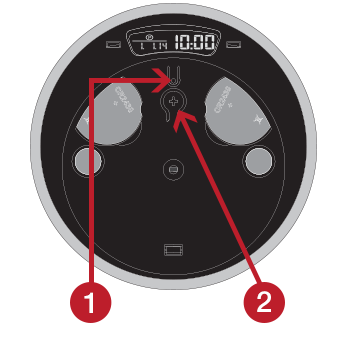 The diode is located in the slit close to the round button on the back of the parking disc. You can buy a suitable battery at any store which sells button cell batteries. When you replace the battery, you have about five minutes to replace the battery without losing the electronic settings. Note that the parking disc’s LCD display shuts down to save battery power. If the parking disc does not display the time, don’t leave your vehicle. If you do not manage to replace the battery within five minutes, enter the time and date again (see above). The arrow on ParkOne 2 sometimes seems to flicker. Is the parking disc in good working order? A flickering arrow on the front of the disc is of no importance to the function of ParkOne 2. Your ParkOne 2 is in good working order. The arrow flickers only when ParkOne 2 is exposed to strong sunlight. The flickering depends on the angle of direction of the sunlight. Hold your hand in front of ParkOne to shade it from the sun and the flickering stops. All LCD displays flicker to some extent in strong sunlight. In fact, it’s quite normal for an electronic parking disc. 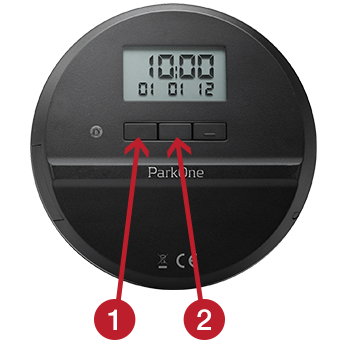 How long does it take the ParkOne 2 parking disc to display parking time? It takes ParkOne 2 no more than 20 seconds to display your parking time – although 20 seconds seems like a long time when you’re standing and waiting for it to happen. My ParkOne 2 falls off the windscreen – What should I do? The windscreen was either not clean or warm enough when you attached the disc. It is important that you heat the windscreen to AT LEAST 15°C. If not, due to condensation, the adhesive on the pads won’t adhere properly to the windscreen. Try heating the windscreen carefully (e.g. using a hair dryer). Once they have fallen off, the self-adhesive pads cannot be used again. You can purchase a new set of self-adhesive pads from your ParkOne 2 dealer. Is ParkOne exclusive a legally approved electronic parking disc? ParkOne exclusive is approved by the Danish transport authority in accordance with Executive Order no. 327 (2003) on parking discs, and approval code FS17 is imprinted on the front. Does ParkOne exclusive function when it is cold? ParkOne exclusive is tested to function at extreme temperatures from -20 to +75 °C. Can ParkOne exclusive be taken down and moved? If you cannot remove the disc in this way, using a sharp, flexible kitchen knife or Stanley-type utility knife with a long blade, cut through all four pads. You can then rub the pads off both the windscreen and ParkOne exclusive. Self-adhesive pads are available at most ParkOne exclusive dealers. We recommend that you use the original 3M pads as these are tested as suitable for use with the product. Can I hoodwink an electronic parking disc and operate ParkOne exclusive remotely? ParkOne exclusive is an enclosed system. It is tested as non-responsive to external impulses. If you attempt to open the parking disc, the software is programmed to self-destruct. How does ParkOne exclusive work? 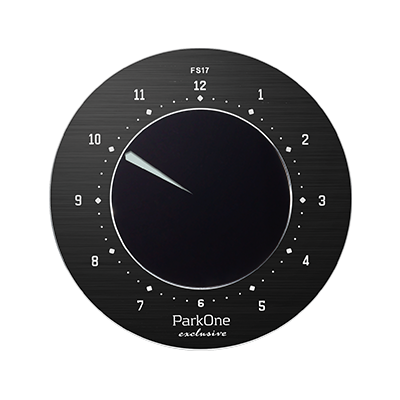 When you park your car, ParkOne exclusive sets automatically at the next quarter of an hour after your time of arrival (e.g. if you arrive at 11:37, ParkOne exclusive sets itself at 11:45). Is ParkOne exclusive covered by the vehicle’s insurance? Does ParkOne exclusive work in all cars? ParkOne exclusive works in any type of vehicle, including hybrid and electrically-powered cars. Can I use ParkOne exclusive abroad? The battery will last for approximately 3 years. When there is about one week’s battery power remaining, the diode flashes for 10 seconds, when ParkOne exclusive enters or leaves parking mode. You can buy a suitable battery at any store which sells button cell batteries. If you do not manage to replace the battery within five minutes, enter the time and date again as described in the product manual. 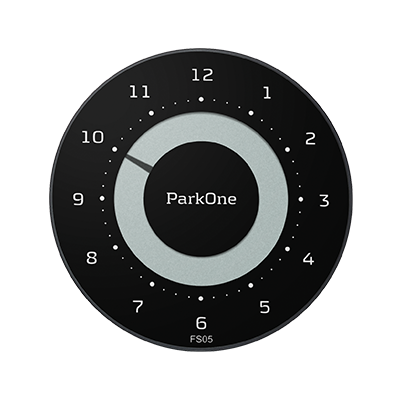 How long does it take the ParkOne exclusive parking disc to display parking time? It takes ParkOne exclusive no more than 20 seconds to display your parking time. My ParkOne exclusive falls off the windscreen – What should I do? Once they have fallen off, the self-adhesive pads cannot be used again. You can purchase a new set of 3M self-adhesive pads from your ParkOne exclusive dealer. Is PARK MINI a legally approved electronic parking disc? PARK MINI is approved by the Danish transport authority in accordance with Executive Order no. 327 (2003) on parking discs, and approval code FS21 is imprinted on the front. When ”hours” flashes, press repeatedly on button 2 until the clock is set at the correct hour. Press button 1 once until ”minutes” starts to flash. Set minutes using button 2. Does PARK MINI function when it is cold? PARK MINI is tested to function at extreme temperatures from -20 to +75 °C. It is laboratory tested and tested under natural conditions from Lapland to the Sahara. PARK MINI functions even if it is exposed to temperatures above or below the interval stated above. Can PARK MINI be taken down and moved? If you cannot remove the disc in this way, using a sharp, flexible kitchen knife or Stanley-type utility knife with a long blade, cut through all four pads. You can then rub the pads off both the windscreen and PARK MINI. Self-adhesive pads are available at most PARK MINI dealers. We recommend that you use the original 3M pads as these are tested as suitable for use with the product. Can I hoodwink an electronic parking disc and operate PARK MINI remotely? PARK MINI is an enclosed system. It is tested as non-responsive to external impulses. If you attempt to open the parking disc, the software is programmed to self-destruct. How does PARK MINI work? When you park your car, PARK MINI sets automatically at the next quarter of an hour after your time of arrival (e.g. if you arrive at 11:37, PARK MINI sets itself at 11:45). Does PARK MINI work in all cars? PARK MINI works in any type of vehicle, including hybrid and electrically-powered cars. Can I use PARK MINI abroad? The battery will last for approximately years. 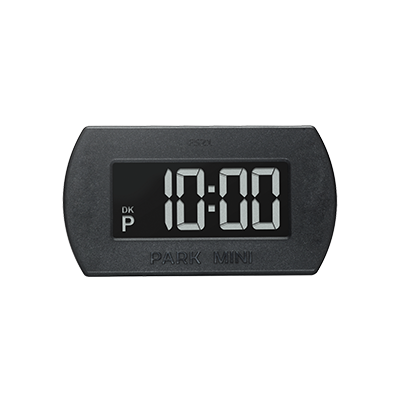 When there is about one week’s battery power remaining, the diode flashes for 10 seconds, when PARK MINI enters or leaves parking mode. Remember to set time and date as described in the manual. How long does it take the PARK MINI parking disc to display parking time? It takes PARK MINI no more than 20 seconds to display your parking time. My PARK MINI falls off the windscreen – What should I do? The windscreen was either not clean or warm enough when you attached the disc. It is important that you heat the windscreen to AT LEAST 15°C. If not, due to condensation, the adhesive on the pads won’t adhere properly to the windscreen. Try heating the windscreen carefully (e.g. using a hair dryer). Once they have fallen off, the self-adhesive pads cannot be used again. You can purchase a new set of 3M self-adhesive pads from your PARK MINI dealer. Is ParkOne a legally approved electronic parking disc? ParkOne is approved by the Danish transport authority in accordance with Executive Order no. 327 (2003) on parking discs, and approval code FS05 is imprinted on the front. To activate the setting function, press and hold down button 1 until ”hours” starts to flash. Does ParkOne function when it is cold? ParkOne is tested to function at extreme temperatures from -20 to +75 °C. It is laboratory tested and tested under natural conditions from Lapland to the Sahara. 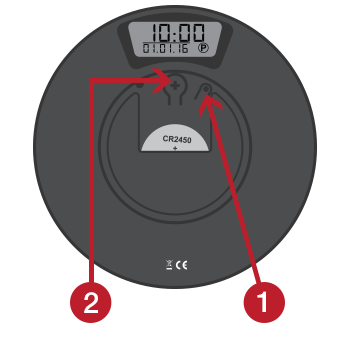 ParkOne functions even if it is exposed to temperatures above or below the interval stated above. Can ParkOne be taken down and moved? If you cannot remove the disc in this way, using a sharp, flexible kitchen knife or Stanley-type utility knife with a long blade, cut through all four pads. You can then rub the pads off both the windscreen and ParkOne. Can I hoodwink an electronic parking disc and operate ParkOne remotely? ParkOne is an enclosed system. It is tested as non-responsive to external impulses. If you attempt to open the parking disc, the software is programmed to self-destruct. When you park your car, ParkOne sets automatically at the next quarter of an hour after your time of arrival (e.g. if you arrive at 11:37, ParkOne sets itself at 11:45). Is ParkOne covered by the vehicle’s insurance? Does ParkOne work in all cars? ParkOne works in any type of vehicle, including hybrid and electrically-powered cars. Can I use ParkOne abroad? The battery will last for approximately 3 years. When there is about one week’s battery power remaining, the diode flashes for 10 seconds, when ParkOne enters or leaves parking mode. The arrow on ParkOne sometimes seems to flicker. Is the parking disc in good working order? A flickering arrow on the front of the disc is of no importance to the function of ParkOne. Your ParkOne is in good working order. The arrow flickers only when ParkOne has been exposed to strong sunlight. The flickering depends on the angle of direction of the sunlight. Why does my ParkOne switch off shortly after I attach it to the windscreen? You may not have removed all of the foil cover on the battery. Remove the battery from the battery box. Wipe the battery with a clean, soft cloth. Reinsert the battery box. This should resolve the problem. How long does it take the ParkOne parking disc to display parking time? It takes ParkOne no more than 20 seconds to display your parking time. My ParkOne falls off the windscreen – What should I do? Once they have fallen off, the self-adhesive pads cannot be used again. You can purchase a new set of 3M self-adhesive pads from your ParkOne dealer. Is PARK LITE a legally approved electronic parking disc ? PARK LITE is approved by the Danish transport authority in accordance with Executive Order no. 327 (2003) on parking discs, and approval code FS21 is imprinted on the front. Does PARK LITE function when it is cold? PARK LITE is tested to function at extreme temperatures from -20 to +75 °C. It is laboratory tested and tested under natural conditions from Lapland to the Sahara. 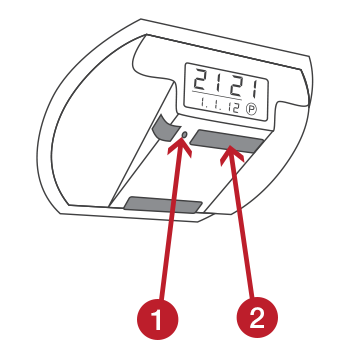 PARK LITE functions even if it is exposed to temperatures above or below the interval stated above. Can PARK LITE be taken down and moved? If you cannot remove the disc in this way, using a sharp, flexible kitchen knife or Stanley-type utility knife with a long blade, cut through all four pads. You can then rub the pads off both the windscreen and PARK LITE. Self-adhesive pads are available at most PARK LITE dealers. We recommend that you use the original 3M pads as these are tested as suitable for use with the product. Can I hoodwink an electronic parking disc and operate PARK LITE remotely? PARK LITE is an enclosed system. It is tested as non-responsive to external impulses. If you attempt to open the parking disc, the software is programmed to self-destruct. How does PARK LITE work? When you park your car, PARK LITE sets automatically at the next quarter of an hour after your time of arrival (e.g. if you arrive at 11:37, PARK LITE sets itself at 11:45). Does PARK LITE work in all cars? PARK LITE works in any type of vehicle, including hybrid and electrically-powered cars. Can I use PARK LITE abroad? The battery will last for approximately 3 years. 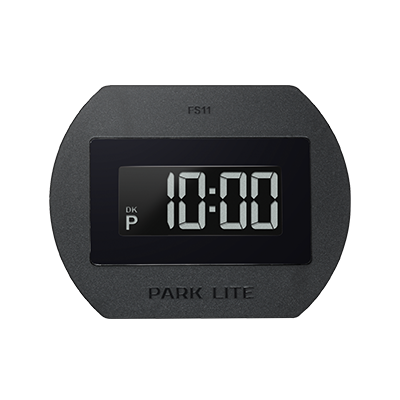 When there is about one week’s battery power remaining, the diode flashes for 10 seconds, when PARK LITE enters or leaves parking mode. Remember to set time and date as described above. How long does it take the PARK LITE parking disc to display parking time? It takes PARK LITE no more than 20 seconds to display your parking time. My PARK LITE falls off the windscreen – What should I do? Once they have fallen off, the self-adhesive pads cannot be used again. You can purchase a new set of self-adhesive pads from your PARK LITE dealer.